This has been an area of intense interest over the past few years and we have had many trial and errors along the way. This focus started when we were planning the moon photo in 2013 and through months of research, trial and planning we found out that in order to have a couple properly silhouetted on the moon would require knowing where the moon was going to be, when it was coming up and how far away from the couple we would need to be. You can read all about that photo in specific here. 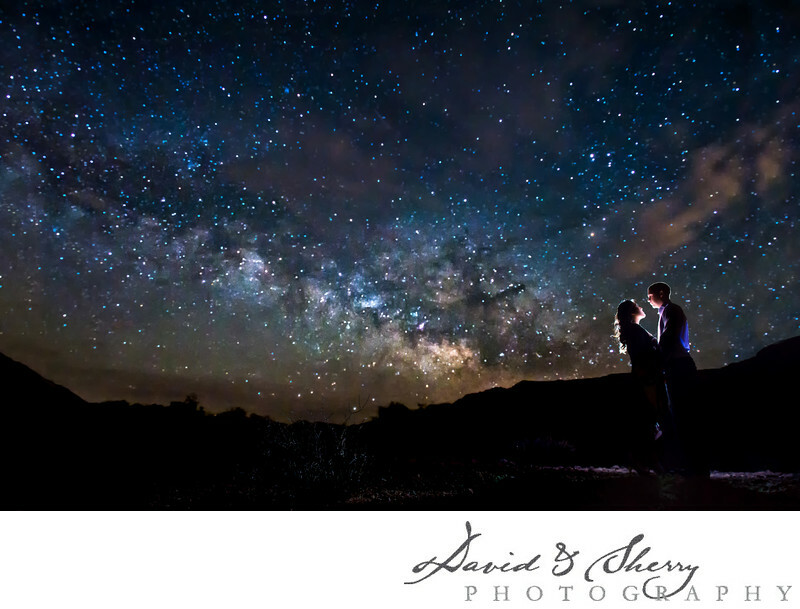 After our interest was peaked in regards to night time landscape photos we turned our attention to how to incorporate stunning photos of the Milky Way with our couple as prominent figures in the picture, and to do it in a way where we are still able to capture the style and emotion planned for during our Couplescape adventure. The Milky Way photo has it’s own challenges as the really nice part of the Milky Way is more often visible from the Southern Hemisphere so we need to do our research as to when it will be visible in Canada. It does pop up above the horizon fairly regularly, and we must be aware of those times and combine them with a time when the moon is hidden as the moon will overpower the area with light to where you can’t see the stars. When looking at the Milky Way with our naked one must focus intently to see it, but with the camera we have the ability to gather more light with a longer exposure in order to see it more clearly. With the proper planning and a location that has enough darkness or specifically we are looking toward a location that has low light pollution we can certainly execute a gorgeous photo when needed. Now all we need is a clear sky ;). To give you a real picture of what it might look like here are a couple examples of what we have done with our clients in order to capture a specific shot. The first time we succeeded in capturing the Milky Way was when we were in Las Vegas with two wonderful people. In order to find a sky that was dark enough we had to drive an hour and a half north of town to the Valley of Fire State Park where we left the hotel at 12:30 am… some of us napped in the car on the way there and once present we were faced with the rules of the park that said you couldn’t leave these two certain areas. Our milky way was in the sky but we couldn’t see it because of the limitations of our location. So we drove around the park to places we were allowed to shoot and eventually found one. By 3:30am we started shooting and it was cold. We were fortunate to capture our shot quickly at that point as while we were in the perfect spot the clouds rolled in and spelled an end to our picture taking. We then got back in the car, drove back to the hotel and went to sleep as the sun was going up. Another time our couple drove up to a spot we had permission to shoot at north of Toronto near Georgian Bay, on a farm in an area of much darkness without much light pollution. In order to get where we needed to go we had to trek through knee high wet grasses to the middle of a hill where we had the best view of the milky way. The temperature had dropped considerably and while it wasn’t “cold” it was chilly enough to make us wish we were warmer :). This time we had set up certain lighting to make the images better and we photographed until we had gotten a nice variety of pictures. We then trekked back through the field to an awaiting cup of hot chocolate which our friends made for us. There are a few photos in mind that we would love to capture with the right people, we’d like to do a night time star photo at Peyto Lake, Morraine Lake and Death Valley. 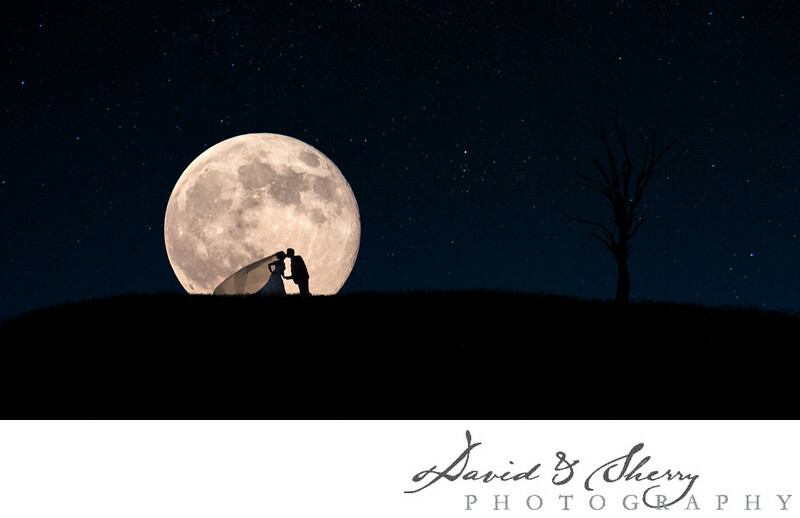 If you would love for your Couplescape to be a 'stellar" one (he,he) and one of these places sounds like an awesome adventure for you and your fiance please let us know. All this to say is that it is most definitely possible but sometimes requires some effort to get to where we need to be. If you’d like a night time Milky Way Couplescape please let us know and we will be happy to begin planning and find a time and place to make it happen.